"God Has A Plan For Us And We Will Be Fine. We Will Be Buckeyes Forever." So ended Jim Tressel's resignation letter to Ohio State president Gordon Gee, sans exclamation points or "Go Bucks." This would appear to be his Rapture, whatever God's plans were. Tonight, though, if SI delivers on the promises coming from their headquarters (see here and here), the storm for Tressel could only be beginning. The forever of which he speaks ain't gonna start tonight. SI's George Dohrmann tweets that the Tressel piece will be up sometime between 7:30 and 8 tonight. You're more than welcome to talk about it down below, and we'll keep our eyes peeled for any bombshells. 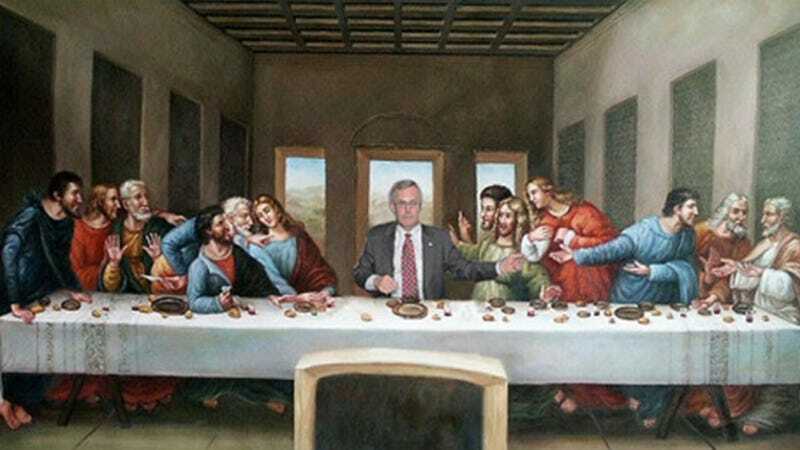 Photo by PolkPanther, from our Jim Tressel Signing Things Gallery. Poignant. Thank you for your continued support of Deadspin, and a more important thank you to America's servicemen and -women, living and gone, who sacrifice for us. Usual wrecking crew back around these parts tomorrow. Hope you had a lovely holiday.